My approach as I've said elsewhere is that I read a lot of books on this subject matter as an inoculation of sorts against the dominant narrative within our culture that absolves itself of responsibility for the historic and contemporary systematic marginalization of people of color in the US and the world as a whole. In a world in which a blatant and open race-baiting, sexist, xenophobic president of the US continues to dehumanize large swaths of people (much to many white people's encouragement or disinterest--a dynamic that further empowers white supremacy), it's important for me to continue to hear marginalized people's voices, experiences, and challenges to the status quo. To listen to and embrace the truth of marginalized people's lives in a white-male dominated world can be a radical act--particularly when we are drowned in media that promotes a set of values (neoliberal economics) that reinforces these power differentials and requires the exploitation and disregard of marginalized folks. With each book that I've picked up, it has given me another piece of the puzzle to my own internalized racism (because if I've given any hint otherwise that I'm somehow immune to the white supremacy woven into our culture's fabric, then I apologize--I do not see myself apart from this--I am just as much a part of this as anyone else with the sole exception that I recognize it and continue to work to curb its effect), understand how others enact and experience white supremacy, and learn (hopefully) more effective ways of combatting it. And this must be an ongoing process, not just for the reason mentioned in the previous paragraph but because it is a moving target. Many of the histories that I have read remind me of this emphatically. Slavery ends and Jim Crow begins; Jim Crow ends and mass incarceration begins. Each time progress is made, there is a white-backlash attempting to push back the progress towards a more equal, fair, and equitable society. 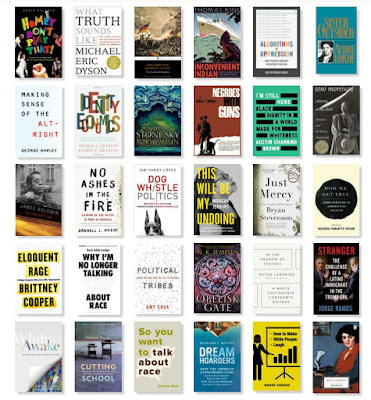 To date (mid-July), I've read 113 books this year. Of those, about 43 have made it onto this list or about 38%. I think that's a smart goal to work towards in my reading--somewhere near the 1/3 to 2/5 of my reading should entail books about and by people who are speaking to life in ways that are different from mine. I would even aim for more, but I am also pulled by that which I must read for my doctorate's program and research as well as that relevant to my professions of instructional design and teaching too. Then, also there is reading that is just for pure enjoyment. Yet--and this is the IMPORTANT PART--besides the doctorate reading because that is hyper focused--the other categories (reading on instructional design, teaching, and enjoyment) are not mutually exclusive from the goal of reading works by or about marginalized people. Hopefully, these lisits have illustrated that point in a crystal clear fashion. For instance, I'm a fan of fantasy and therefore, N. K. Jemisin meets boths the pure-enjoyment category and reading works by individuals in marginalized groups (and focusing on marginalized people--seriously, read Broken Earth trilogy and thank me later). If I want to look at books on teaching, I can easily look to For White Folks Who Teach in the Hood... and the Rest of Y'all Too: Reality Pedagogy and Urban Education by Christopher Emdin, which is a book that focuses on teaching in urban and/or marginal settings but is applicable to every classroom and is so damn good! All this is to say, I'm going to keep on this reading journey and will inevitably share new insights back on this blog here. It's been invaluable and rewarding for me to read such amazing and powerful works and I suspect that will continue to be the case. I hope that you have enjoyed reading this series on my blog as much as I have enjoyed reading, writing, and reflecting about it. I will leave you with some parting questions to ponder (on your own, in the comment feature below, in an email to me, or maybe on your own blog--let know and maybe I can do a follow up from the readers who post!). How often do you make an effort to read works by or about marginalized folks (particularly, if you are a white person)? Is it an active strategy? Why do/don't you seek out such works? What do you take from reading such works? How do you find and choose books to read? What are some of you most powerful and mind-altering books in this category? What are you doing with what you have learned in these books? Finally, here is the updated list of books that I've read since I wrote the first set of posts. Take a look and see what additional amazing works are out there.